The Rotary Club Rome International is the only English speaking Rotary Club in Rome. The objective of our Club is to foster a world of service-above-self through diversity, tolerance, peace and international understanding. 6) Economic and community development. Rotary is where neighbors, friends, and problem-solvers share ideas, join leaders, and take action to create lasting change. We connect people. Rotary unites more than 1 million people with +35,000 clubs. worldwide. We transform communities. We take action locally and globally. We solve problems. No challenge is too big for us. We bridge cultures and connect continents to champion peace, fight illiteracy and poverty, promote clean water and sanitation and fight disease. 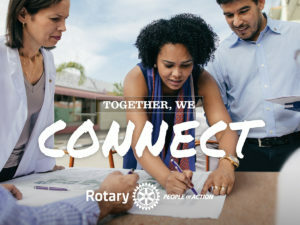 Through Rotary clubs, people from all continents and cultures come together to exchange ideas, form friendships and professional connections.